I don’t remember the last time a “no changes” banlist announcement was met with so much contention and disagreement. Although some players have expressed satisfaction and relief at Wizards’ decision last week, others have done the opposite, questioning Wizards’ understanding of Modern, challenging the banning of some cards and not others, and overall doubting Wizards’ ability to manage the format. I may have been on vacation last week, but I’ve still seen a lot of this discussion in communities and articles all across the internet. In today’s article, I want to take a little time to respond to some of the most common questions and arguments about both the banlist and the 7/13 announcement. In my last two banlist articles, the prediction article from a few weeks ago and my retrospective from last Monday, I emphasized the importance of historical and metagame context in making banlist assessments. This includes understanding the current metagame, understanding past banlist decisions, and (perhaps most importantly) citing sources and evidence on both those points. Banlist discussion often takes place without any evidence or, worse, with “evidence” that is flat out wrong. In that spirit, this article tries to give some evidence and context to the most common banlist questions. 1. Why Analyze Modern Banlist Decisions Anyway? Behind all this banlist discussion is the big Griselbrand in the room: can we even discuss the banlist without knowing all the ins and outs of Wizards and the DCI? Because none of us have special insight into their decisionmaking process (if you do, please email! ), and Wizards often comes off as quite opaque in their ban approach, it seems like we just don’t have enough information to discuss bannings. It can come off as groundless speculation and theorizing, and we might end up questioning both our thought process (which could lack important evidence) and our conclusions (which might be totally misinformed). There are three reasons I don’t subscribe to this interpretation and why you shouldn’t either. First, we actually do have a lot of information from Wizards, including their many banlist announcements, articles discussing the format, and the intersection between community-collected metagame data and Wizards’ management of the format. I wrote about a lot of these datapoints in my March 23 banlist prediction article, and you can browse the quotes in that piece to see just how many datapoints we really have. For instance, when Birthing Pod was banned, Wizards’ explicitly cited the deck’s high metagame share and the fact that Pod decks won the most GPs in the past year. This gives us a precedent for analyzing future decks: when decks reach Pod levels, we know they might be in danger. And when they aren’t quite there, we know they are probably safe from being banned for reasons of metagame dominance/diversity. This approach is applicable to other bans (Bloodbraid Elf and Seething Song), and gives us a wealth of case examples to draw in in future ban analysis. The second reason we should keep predicting and analyzing banlist decisions is because people will be doing it anyway. If Modern players are going to keep speculating about the banlist at kitchen tables, in game stores, and throughout forums, we need authors to try and synthesize those opinions and address certain claims directly. The discussion is happening anyway: we are just trying to dig deeper than most people get in a single r/spikes post. That’s a collective responsibility by all Magic authors, not just the ones on this site. This brings me to the third reason we should theorize and analyze the banlist: responsibility to Modern. I love Modern and want to do what I can to make it the best format it can be. A part of that is helping to gather information and evidence and present it to readers, adding in my own analysis and opinion where it is helpful and relevant. This is the same approach taken by hundreds of other Magic authors (with varying degrees of success, especially with evidence). So long as we continue to love our format and game, we will also continue to give readers knowledge and frameworks to help them make informed decisions and opinions about Modern. 2. If Seething Song Is Banned, How Did Amulet Bloom/Grishoalbrand Escape Bans? This question and claim takes a lot of forms, including “Wizards doesn’t care about the turn four rule anymore”, “Modern is a turn 2-3 format now”, “Wizards is inconsistent in its bans”, and a variety of other comments about Modern’s (in)famous turn four rule. The big one I see is about Seething Song, wondering how the old Storm staple could be banned under the turn four rule if Nourishing Shoal, Amulet of Vigor, Summer Bloom, and a bunch of other cards can roam free. I wrote extensively on the turn four rule in my 7/13 banlist prediction article, but I want to highlight two key points from that here. These should be your go-to arguments when anyone talks about Storm, Song, the turn four rule, or any cards banned under the turn four rule. When Wizards inaugurated Modern, the turn four rule initially included all decks, not just top-tier ones. But after 2011’s Pro Tour Philadelphia, Wizards modified the rule: “Before Pro Tour Philadelphia, the DCI’s stated guideline for the Modern format was to avoid having decks that consistently win the game on turn three. With the results of the Pro Tour in, we are tweaking that goal to not having top-tier decks that consistently win on turn three (or earlier).” This means a deck must be top-tier, as defined by Wizards, to fall victim to a turn four rule banning. Note that the deck also has to “consistently” win the game before turn four, which is a whole separate question. Seething Song took the ban-axe in January 2013, falling alongside everyone’s favorite Bloodbraid Elf. When Song got banned, it was under the exact same turn four rule that Wizards defined after PT Philly: no top-tier decks that consistent win on turn three or earlier. As Wizards stated in their decision, “Looking at the results of the recent tournaments, Storm is not the most played deck, but it is among the top tier of decks. Four of the players to get at least 18 points at Pro Tour Return to Ravnica were playing Storm, and Olivier Ruel had a Top 8 performance at Grand Prix Lyon playing Storm. On Magic Online, Storm is the second-most-frequent high-finishing deck in Modern events, at 11.42%, behind only Jund. These results indicate that, while far from dominant, Storm is a top tier deck.” We can argue about why Storm was top-tier (it was cheap, it was good in that metagame, etc. ), but the point still remains that at the time of its banning, Storm fit numerous prevalence-based criteria for top-tier status. To be clear, this isn’t an exhaustive list of turn four rule considerations (the other article is more comprehensive). But these are the most important two points in this current timeframe, and the ones you need to be aware of whenever people bring this question (and its variations) up in conversation. Once we understand these two rules, it becomes a lot clearer as to why neither Amulet Bloom nor Grishoalbrand ate bans: the decks are either not consistent and/or not top-tier. I am leaning heavily towards “not top-tier” based on their metagame prevalence. Amulet Bloom has less than 5% of the format, and only around 3% in paper as compared to 5% on MTGO. Grishoalbrand is even lower, with just a 2% metagame share and sub-2% shares in both paper and MTGO (it got the most play at GPs). All of which is to say, Wizards cannot ban any cards from these decks under the prevalence-based rationale for which they banned Song. A common objection to this rationale, or at least a complicating explanation, is that Storm was only 11.42% of the MTGO metagame because it was cheap. There is certainly truth to this. While Jund mages had to spend over $1000 to get all the Tarmogoyfs and Liliana of the Veils they needed, Storm players were spending well under $300 on bargain-bin specials like Goblin Electromancer and Epic Experiment. This made Storm the cheapest tier 1 deck in Modern (by far) during the height of its power. But should the deck’s price matter in determining its bannability? Modern’s history is full of decks that are prevalent because they are cheap: Burn is the biggest one today, with Merfolk close behind. But neither of these decks are both top-tier and consistently winning before turn four. Wizards’ internal data suggested Storm was winning before turn four in some large percentage of games, and that percentage was apparently too high given Storm’s format-wide prevalence. This puts Storm in a separate category from other cheap decks like Burn and Merfolk. It also points to a big factor underlying the turn four rule which is format enjoyability. Unlike Legacy, we don’t have the police cards to combat fast, non-interactive turn three wins. If a deck is 11% of the MTGO format and winning on turn three in some large percentage of games, that’s a big hit on format enjoyment. Of course, this returns to the problem of Wizards’ transparency because we don’t know what that actual turn three win cutoff is. But whatever it was, Storm was violating it in a way that no other deck did (and no other deck currently does). That was happening independent of its price and that’s why Song ate the ban. Note again that neither Grishoalbrand nor Amulet Bloom have the metagame prevalence to justify top-tier status in the eyes of Wizards, which is why the Song rationale doesn’t apply to them. 3. If the Format Is Healthy, Why Not Unban Cards? Some Modern players criticized the announcement for the lack of bannings. Others were fine with no bannings but disappointed that nothing was unbanned instead. One of their key arguments is that healthy formats represent an ideal time to unban a card. Modern is quite healthy right now, with no single deck making up more than 10% of the metagame, and a ton of color and archetype diversity among the top-tier. This suggests the format is quite stable and ready for a limited-means unban like Sword of the Meek. A key datapoint here is the September 2012 unbanning of Valakut, the Molten Pinnacle. In that announcement, Wizards explained “Recent Modern tournaments have been diverse, with no deck dominating the metagame. Since Modern is a non-rotating format, banned cards never rotate out. The DCI is unbanning a card to see how that affects the format.” For many players, this perfectly described the current state of Modern, and they were looking forward to the Valakut-equivalent unban today. Of course, no unbannings happened on July 13, leading some players to accuse Wizards of inconsistency, and others to believe Wizards only unbans around Pro Tours (we’ll table that until the next section). But there are other explanations for the lack of unbans and we need to understand those before we make other claims. For me, the biggest sticking point is in the difference between a “diverse metagame” and an “evolving metagame”. A “diverse metagame” is trend-agnostic. Maybe decks are moving up and down the metagame charts, or maybe they have been stable for months. “Diverse” just suggests that there is some baseline of diversity among the top decks, but not how that diversity has changed over time (or is currently changing). I often call metagames “diverse”, but in doing so I don’t always account for what trends are informing that diversity or how that diversity might be changing even as it is being described. That leads us right into the concept of an “evolving metagame”, where the format may or may not be diverse, but it is definitely changing. Our current metagame is a great illustration of an evolving metagame in action. Grixis Control shot up from basically a < 1% metagame share to be one of the most-played decks in Modern. Abzan crashed from a 13% metagame share to a 3% share, with Jund rising from about 1% to 9% in the same time frame. All of this has happened in the last 4-5 months since just February, not to mention all the other changes around decks like Tron, Merfolk, Affinity, Burn, Grixis Delver, Company decks, etc. When you introduce powerful cards like Kolaghan’s Command and Collected Company into a format, it can take time for the metagame to shape around them. Until that happens, the metagame is still evolving and it’s hard to know what decks will come out on top and what will fall to the bottom. Because we are in an evolving metagame, we should not have expected a single unban. Unbans necessarily help certain archetypes and hurt others. It’s hard enough to predict that effect in a stable metagame, but much harder to do so in an evolving one. Take Ancestral Vision as an example. Vision ostensibly helps control decks and hurts BGx decks, which might make it a great unban in a metagame where control is flagging and Jund/Abzan is on top. But right now, Jund is only a few percentage points ahead of Grixis Control. Abzan is way behind and Grixis Control is still on the rise. Unbanning Vision in this environment would be very risk. Maybe Grixis Control settles at a 10% metagame share. That’s healthy on its own but with Vision added, maybe that goes up to 15%: much riskier from a metagame health perspective. Maybe Jund is at about 10% now with Abzan at 3%-4%. Add Vision and maybe Abzan stays where it is and Jund falls down to 5%. It’s impossible to predict because the metagame is fluctuating as it is even before a card is unbanned. This is why you should never expect unbans in evolving metagames: it’s too hard to predict their impact. 4. Do Bans/Unbans Only Happen Around Pro Tours? One of the most popular banlist theories floating around the Modern community is that Wizards only changes the banlist around Pro Tours. There is certainly precedent to suggest this, with every unban coming in the announcement immediately before a Pro Tour, and many of the post-2011 bans falling in the same time frame. Although Wizards has never openly admitted to this logic in its announcements or articles, the timing seems very convenient when comparing banlist updates to Pro Tour dates. Implicit in all this is a veiled accusation that Wizards only cares about the larger, pro-based metagame. Because the Pro Tour (read: Promotional Tour, not Professional Tour) is all about drumming up the game and the hosted format, Wizards has a lot of economic incentive to make them awesome. But this often leaves the everyman player in the dust, because Pro Tour event timing is valued more heavily than GPs or other smaller tournaments. Also, if this claim were true, we would never want to expect bans or unbans unless a Modern Pro Tour was right around the corner. Let’s look at the “no bans” side of this argument first. Based on the evidence we have, this seems patently unsupportable to me. Bloodbraid Elf, Seething Song, and Second Sunrise were all banned in 2013 when there wasn’t even a Modern Pro Tour on the schedule. Although one could argue that 2013 was an exception specifically because there was no Modern PT on deck, this doesn’t make sense given the context of banlist updates. We already know that a key evidence point for this argument is the unbanning of Valakut, which happened a month before Pro Tour Return to Ravnica in October 2012. If that is evidence in favor of the theory, the subsequent bannings only 4-6 months later must also be included as evidence against the theory: they are all within the same timeframe. It seems much likelier that bans happen on an annual basis, except in the case of an emergency like Second Sunrise and Eggs. This year-long timeframe gives Wizards enough datapoints to consider if a ban is necessary. That’s why we have seen major banlist changes three times in January 2013, 2014, and then 2015: that’s just the schedule Wizards has locked itself into, starting with the Bloodbraid and Song bans. So in answer to the question, no, bans do not necessarily happen only around Pro Tours, although they are likely to happen in January of any given year). The unban side is much more open. Unlike the bannings, where we have three counterexamples, all format unbannings have occurred within a month of the next Modern Pro Tour. 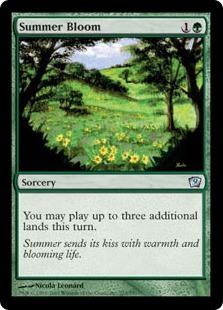 This includes Valakut, Wild Nacatl and Bitterblossom, and the throw-away unban of Golgari Grave-Troll. Although that’s hardly a commanding sample size, it’s still 100% of the unbans since the format’s creation. Despite this, I am much more inclined to think it relates to the general banlist cycle I described above and not explicitly to Pro Tours. It takes about a year of data for Wizards to figure out if a deck is broken or fair. Ever since the Bloodbraid and Song banning, Wizards might have locked itself into an annual, January-based banlist cycle. If that’s when bans need to occur, then that might also be when unbans need to occur as well. This would be both to cushion the impact of a banning (and appease the unhappy masses), and because you need that year of data to know the unban is safe. If that is true, then the Pro Tour timing is just incidental to the January timing of banlist announcements. An exception to this would be a deck that was overtly broken even without a years-worth of data behind it. Treasure Cruise was broken just 3-4 months in, and I suspect it would have been banned regardless of the Pro Tours timing in February 2015. So overall, the ban cycle appears to be tied to Januaries and not to Pro Tours, although Pro Tours themselves are now based around a January-February cycle. Hopefully this answered some of the big questions around the bannings and unbannings, or at least gave some new perspective on these issues. Anything you think I missed? Alternate theories and explanations? New evidence and data I didn’t consider? Let me know in the comments and I look forward to talking about it there. There’s a old school balancing game called “Topple”, where you place little weights around a balancing platform. Adding or removing weights, even if it looks stable, could spell disaster, and of course the platform ‘topples’ over. Now, Modern isn’t going to “topple” over, but it a good thing for the format when everything is nice and even, and I think this is what we have today (as you are saying). I can see how adding or removing cards from the format could perhaps create an imbalance. Wizard’s doesn’t want to intentionally make the game any less fun for anyone. I see no changes currently as a good thing! I think that’s a great comparison. Wizards will be more likely to play some “Topple” with Modern if the format is either too stagnant or if a deck is too dominant and an unban can potentially address that. But for now, as you said, we are at a good equilibrium point. For the unbans, I think its perfectly reasonable to save those for when the format feels stagnant as a way to shake things up without needing to print new powerful cards. With delve, kolagans command, and collected company all having big impacts from recent sets, unbanning right now is not only risky balance-wise when the meta is inf lux, but just bad pacing in general for keeping modern fresh. Agree. I would also add that Wizards has a limited supply of unbans they can do to shake up a format, so those should be saved for when the shakeup is needed. To some extent, this is a bit of a marketing and management gimmick, but it also serves an important metagame function. It’s hard to predict what unbans will do in an unstable metagame, and impossible to isolate an unban’s effect from the metagame’s natural evolution. Wizards probably wants to avoid this, which is another reason they hold off from unbanning cards. My question to you: why do you want cards to come off the banlist if the format is diverse, fun, and evolving already? As long as Wizards continues releasing gems like Eidolon and CoCo, there’s no reason to risk the format’s health for the sake of having a shorter banlist, which doesn’t do anything to improve Modern gameplay on its own. For me, the goal isn’t to have the “best-looking banlist” (even there, shorter is not necessarily better), it’s to have the most enjoyable format. I’d assume you either have a pet card on the list, which I can understand but I don’t think is a good reason to unban something that ALL Modern players will then have to potentially be oppressed by, or that you feel there aren’t enough viable, interesting cards in Modern to brew. If you do feel that way, check out my sleepers article from two weeks ago and take a second look at some sets like Darksteel, Innistrad, and even Origins; there are plenty of powerful, unplayed cards in Modern begging to be broken open! There are a lot of reasons that people want to take cards off the banlist, and if you attribute them all to me it’s easy to ignore what I actually said. The specific argument “Save unbans for a stagnant format” was presented, and that’s what I was responding to. That argument seems inherently flawed, because if WOTC can’t keep the format dynamic with new cards why would we think they could manage the unbans well enough to fix the mistake? Well, Maro is on record saying its “professional tour”. Sorry, that was meant more as a joke/comment in the tone of those who believe unbans are tied to the Pro Tour. Didn’t mean it as an actual quote or source (hence no link or citation), so apologies if it came off that way! Interesting article, but I think you need to either pay attention while editing more, or get an editor. I noticed about 3 or 4 mistakes while reading it. Its not really a huge deal, but there are people like me who are really bothered by things like that. We just onboarded an editor actually! The only reason this one evaded the editor was because I was on vacation last week which caused all sorts of scheduling craziness. But starting tomorrow, every article will be edited by our new guy. Let me know if you approve of the quality on the rest of the articles from this week. If you have any other comments, please let me know!